UK Stampin' Up! Demonstrator | make beautiful cards | Crafty Hippy: Bee exceptional and create this Bee Happy Card! There is something about bees and dragonflies that are so evocative of Summer - maybe it's the way they buzz about, busy with their business... flying from flower to flower. As I sit here trying to warm myself up with my Cup-a-Soup, just thinking about it makes me feel warm and happy. Don't forget the Designer Series Paper I've used in this project is FREE during Sale-A-Bration (ends 31st March), when you spend £45 on Stampin' Up! products (excl. P&P). 1. Cut your Whisper White and Crumb Cake cardstock to make your card base. 2. Cut a rectangular piece of Bubbles & Fizz Designer Series Paper - I selected the page that looks like honeycomb (FREE during Sale-A-Bration). 3. 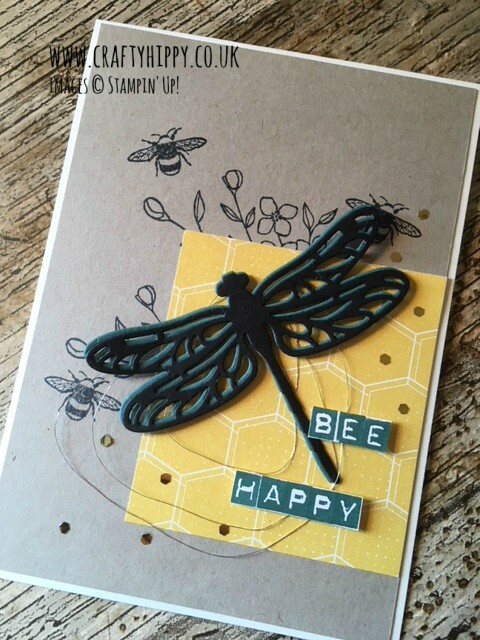 Cut out your dragonflies using the Detailed Dragonfly Dies and Big Shot. I used Basic Black and Tranquil Tide cardstock. 4. Stamp the Crumb Cake Cardstock using Tuxedo Memento Black Ink and the Touches of Texture Stamp Set. 5. Using Tranquil Tide Ink stamp your sentiment using the Labeler Alphabet Stamp Set. 6. Assemble your card using Snail, Dimensionals and a piece of Silver Metallic Thread. 7. Add some Gold Glitter Flakes (which are hexagonal shaped) using the Fine-Tip Glue Pen. And there you have it! 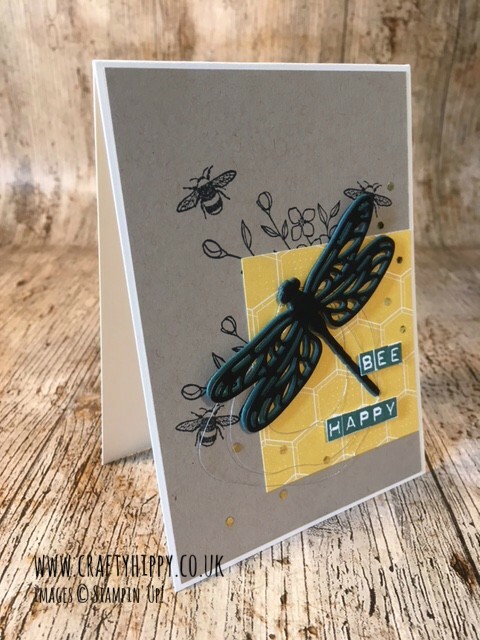 A quick, simple, gorgeous, bee-and-dragonfly-themed card.